Do you ever see something that you want to share quickly with friends and family? 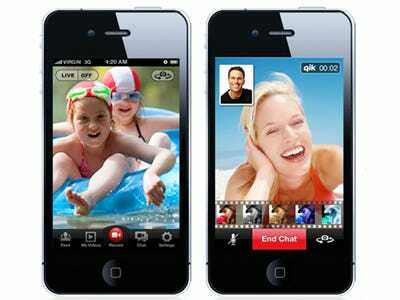 Do you want to video-chat over 3G? Do you want to produce your own live recorded web-show from your iphone? All of these things are possible with Qik video by Skype, and the name is not deceiving. This nifty free little app is extremely fast. In my testing it took 47.84 seconds to open the app, Login, and begin a recording and a live show. When I was already logged in it took just 7.57 seconds to open, and begin broadcasting and recording. Not only is it unbelievably fast… It is also extremely easy to share. With a free account you get your own free sub-domain, and as soon as you start broadcasting, there is an unobtrusive Facebook, and Twitter share button on screen. You can even share your recordings through email, Facebook, Twitter, Text, Camera Roll, and Youtube. The app also comes with thirteen live effects that are fun to play around with. This app is a mix of Ustream, Photo Booth, and Youtube, and it is a pleasure to use. There is also a premium package available, but for the average Joes’ needs this will do the trick. Upload your recorded videos to Youtube where you can download them, and delete the videos from Qik once you’re done and you will already have replaced the function of premium for free. Enjoy this free app, and subscribe to our RSS feed or daily Newsletter for more. Share this with your friends on Twitter and let us know what you think of it below!